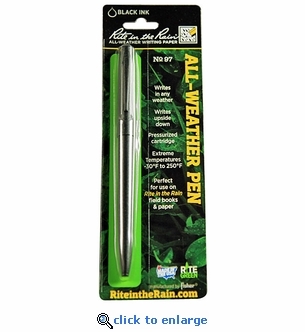 The Rite in the Rain all-weather pen is the number one choice for a reliable pen you can use in the field in any weather. This remarkable pen writes on wet paper, in any position and won't freeze in extreme temperatures. This all-weather, tactical clicker pen has a flat black steel casing and measures 5-1/4" long.